Ray Dalio, one of the world's most successful investors and entrepreneurs, shares the unconventional principles that he's developed, refined, and used over the past forty years to create unique results in both life and business—and which any person or organization can adopt to help achieve their goals. In 1975, Ray Dalio founded an investment firm, Bridgewater Associates, out of his two-bedroom apartment in New York City. Forty years later, Bridgewater has made more money for its clients than any other hedge fund in history and grown into the fifth most important private company in the United States, according to Fortune magazine. Dalio himself has been named to Time magazine's list of the 100 most influential people in the world. Along the way, Dalio discovered a set of unique principles that have led to Bridgewater's exceptionally effective culture, which he describes as "an idea meritocracy that strives to achieve meaningful work and meaningful relationships through radical transparency." 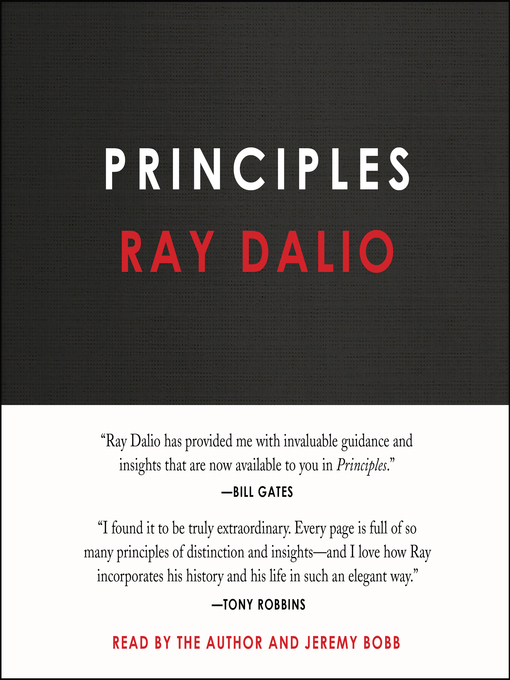 It is these principles, and not anything special about Dalio—who grew up an ordinary kid in a middle-class Long Island neighborhood—that he believes are the reason behind his success.